We’ve teamed up with the NHS and Dom Joly to create a whole new ‘Not QUITE an emergency’ campaign, highlighting awareness of when to use the free, 24-hour NHS 111 helpline! 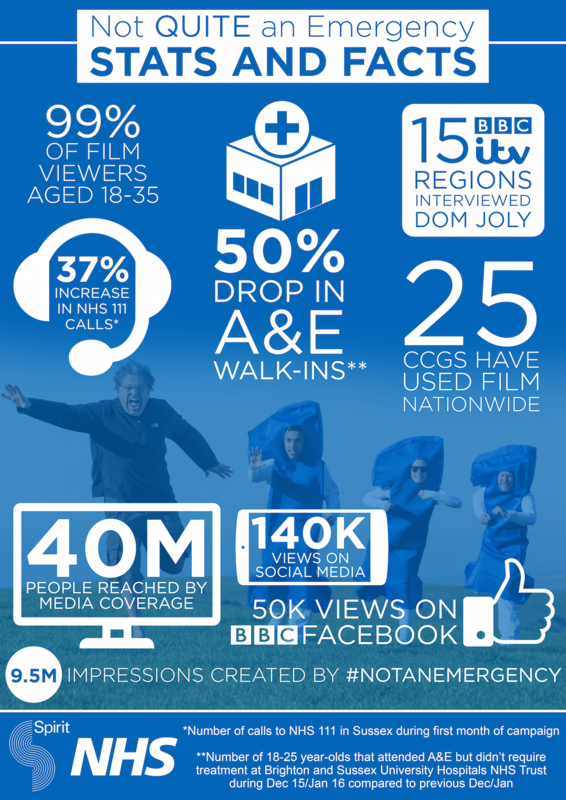 ‘Not QUITE an emergency’, aimed mainly at the under 35s, is the first time the NHS has created comedy content based on pranking. It sees comedian Dom Joly, best known for his “I’m on the phone” catchphrase in Trigger Happy TV for “call 111” and pranking unsuspecting members of the public. The campaign launches in time for the run up to Christmas, one of the busiest times for the nation’s A&E departments and will run until March 2016. It was created as a direct response to a lack of awareness from the public about the non-emergency NHS 111 number, and is the second campaign Spirit has created for the NHS in the last two years. The film shows a disguised Dom blighted by various minor ailments that he refuses to accept aren’t worthy of being considered a medical emergency. We put hidden cameras capturing him trying to seek support from unsuspecting members of the public, before fake paramedics arrive on the scene and try to educate a disgruntled Dom. Media coverage generated with an audience reach of 32.5 million readers, viewers and listeners. Highlights included TV coverage on ITV Meridian and BBC South East, BBC Radio and Metro. 100k views of Dom Joly’s ‘not QUITE an emergency’ campaign video on Facebook and YouTube. Members of the public, community groups, NHS partners and providers took part in a Thunderclap campaign with an audience reach of 206,411 users on Facebook and Twitter. TV personalities including Dermot O’Leary and Jamie Laing shared the campaign video with their 2.78 million and 952,474 Twitter followers respectively.